WTI could pare some of yesterday losses trading currently near $53 per barrel, after it had come under pressure on persisting worries about the global market economic expansion. As China posted its lowest yearly GDP growth rate in the fourth quarter of last year since the credit crisis (the first quarter of 2009) by only 6.4% yearly expansion. The figure made China 2018 growth rate the weakest since 1990 by only 6.6% expansion on weaker domestic demand and higher trade tension between US and China weighed down on the investment spending outlook. The Chinese weak growth figure maintained the worries about the global economic slowdown which has been sparked in the beginning of this week by UN annual economic forecast of global growth by 3% this year and next year following expansion by 3.1/% last year. While this same worry about the global growth was containing the talking among World Economic Forum 2019 attended leaders in Davos without existence of U.S. delegation on decision from Trump who is widely blamed for this slowdown because of his protectionism policies. From another side, FT could spark yesterday more concerns about the trade talks between US and China by releasing a report saying that US refused Chinese offer to hold preparatory talks ahead of high level meetings to be conducted later this month in Washington. The report has shown that Trump might see procrastination and wasting from the Chinese side in the same time he is willing more than ever to reach a deal can support the US equities which slumped by the end of last year. The industrial metals came also under pressure as the worries about the Chinese growth momentum increased sending copper down from $2.72 per pound to be traded currently near $2.66, while Gold could rise again for trading close to $1284 per ounce on increasing demand for risk aversion sent UST yield down. USDCAD rose up for trading above 1.3350 on pressure on the energy prices which lost stream again, after recovering last Friday by the release IEA report which has shown its forecast of oil consumption expansion by 1.4m bpd in 2019 following expansion by 1.3m in 2018. IEA said that it expected this slight rising of demand, despite the probability of watching slower economic growth in 2018. IEA said that US oil production will increase by only 1.3m bpd in 2019 after unexpected rising by 2.1m in 2018. IEA said too that OPEC and NON-OPEC agreed cut production deal on last Dec .7 by 1.2m bpd will bring stability to the market prices but this will take time as OPEC need to lower the current production by 0.9m bpd and NON-OPEC Countries need to lower by 0.37m too. GBPUSD could be boosted by UK released labor report which has shown higher than expected wages growth rate and lower unemployment rate in November. The pair is now trading close to 1.30, as Theresa May is looking for plan B in UK, while the rest of the world is preparing for no Brexit deal. While the UK Labor party leader Jeremy Corbyn is looking now leading the demand for new referendum, after he failed to drive the government down by confidence voting May could gain marginally by 21 votes, after aggressive historical disapproval of her reached deal with EU by 230 margin on Jan. 15! While in Europe the investors are cheered by hopes for bailing out Deutsch Bank, but worried about the Italian banking sector, as the government in Italy is still criticizing the ECB which is looking to it irresponsible and in need for more transparency to remove any doubts about using its authorities for political purposes. WTI rebound from $42.63 has been capped yesterday below $54.67 formed resistance on last Dec. 4, as The mixture has been satisfied by reaching $54.50 in the beginning of the week, before retreating could be extended yesterday to $52.08. WTI rose back for trading currently near $53.30 in its day number 16 of consecutive being above its daily Parabolic SAR (step 0.02, maximum 0.2) which is reading today $51.89. 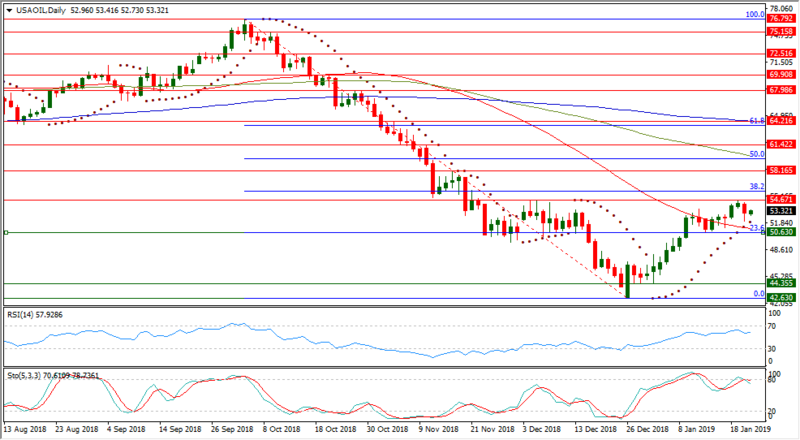 WTI rebound from $42.63 has been capped below 38.2% Fibonacci retracement level of its falling from $76.79. This rebound could send it back above its daily SMA50 but it's still undermined by continued existence below its daily SMA100 and its daily SMA200. WTI daily RSI-14 is still referring to existence inside its neutral area reading now 57.728. WTI daily Stochastic Oscillator (5, 3, 3) which is more sensitive to the volatility is having its main line now inside its neutral region at 70.610 leading to the downside its signal line which is higher in this same area at 78.736, after negative crossover just below the overbought area above 80.